I love the international flavors of various foods. 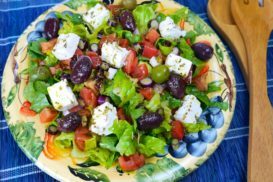 Like this Yasou Greek Salad. Yasou means… to your health! It’s summertime! 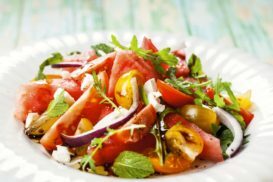 Enjoy this cool, refreshing watermelon and cherry tomato salad. It’s a mouthful of sweet and savory chill time. Bitter and spicy is good for you! 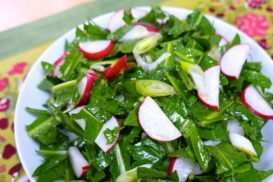 This Marinated Dandelion and Radish Salad is sure to leave you feeling fresh and invigorated. Want a mouthful of seasonal goodness? 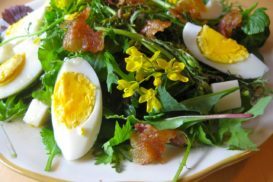 Enjoy this delicious Cobb Salad recipe using ingredients from the local farm! 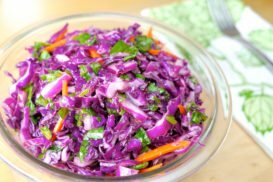 Crunchy and sweet, this Summer Slaw is a delicious way to eat your veggies. As the weather gets warmer, it’s time to lighten up and move from stews to salads. 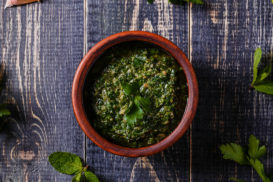 Try this Parsley, Garlic and Walnut Dressing and let me know what you think! As the weather gets warmer, it’s time to lighten up and move from stews to salads. Clear out liver congestion. 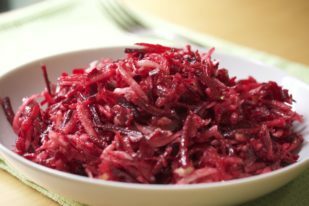 Try this Spicy Dandelion & Cabbage Salad with Horseradish Dressing and let’s get moving! 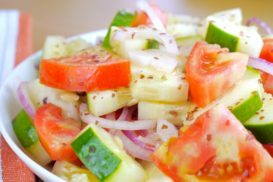 Try this refreshing Cucumber, Tomato and Onion Salad with a pinch of Dulse. Yum! Have you ever tasted Peppedew peppers? 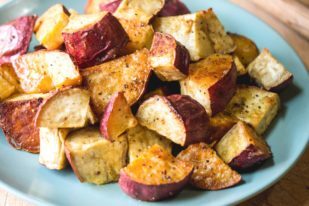 Sweet and mildly hot – I love em’! 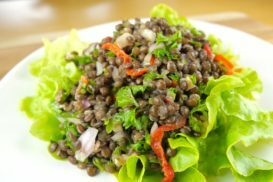 They’re especially good in this yummy Lentil Salad. Did you get a Kohlrabi root in your CSA box and you’re baffled by it? 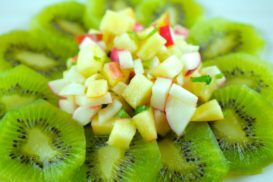 Try marinating it in this delicious salad! 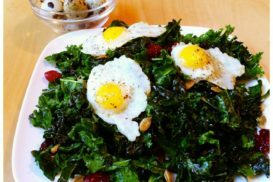 Like kale? 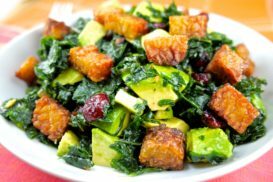 You’ll LOVE this kale salad with Crispy Tempeh Croutons. Oh my! Got radishes and don’t know what to do with them? 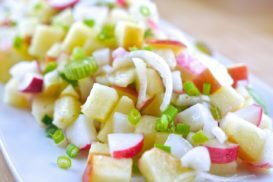 Try this totally delish Radish & Apple Salad. Fresh, crunchy and totally delish! I love Caesar Salad. 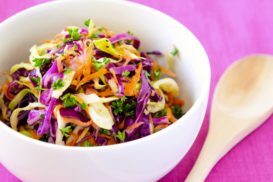 What’s your take on this classic salad recipe? Fresh, crunchy and totally delish! 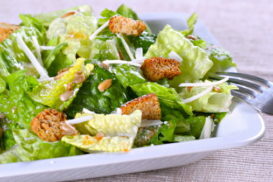 I love this Caesar Salad. 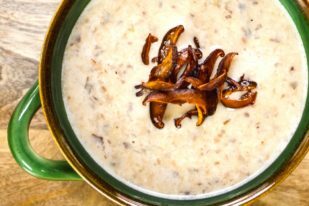 Need a little freshness to help get you through winter? 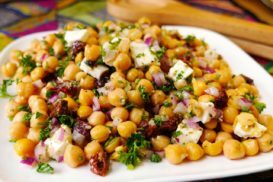 Try this delicious Chickpea, Feta and Sundried Tomato Salad. It’s delish! Want a fresh salad in the middle of winter? 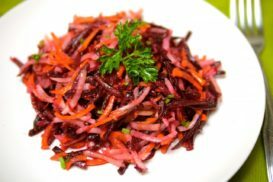 Try this yummy Winter Roots Salad. It’s a winner in winter! Crisp, tangy, salty and delicious! 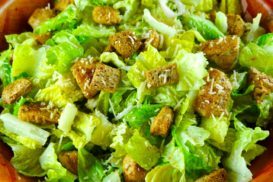 I love a simple and flavorful Caesar Salad. 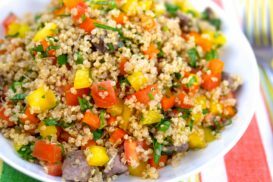 Need a delish summer dish? 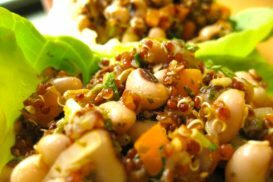 Try this Red Quinoa & Black Eyed Pea salad with Smoked Chimichurri Dressing. Yum!